Native American, Dancing Cat, is lonely and longs to escape the life she is leading as the Cursed One so she can go on the hunt and ride again as the men do. Instead she must crush berries with the other women of her tribe for the Pemmican cakes to feed them when winter falls to prevent starvation. As they prepare for the Harvest Gathering where they will dance and celebrate the Harvest Moon before the snow falls, Dancing Cat consults her ancestors through the powers of prophecy from the sacred bundle, something only the trained Caretaker is allowed to do because of the dangerous powers it harnesses. But she is eager to escape her cruel grandmother and wants answers despite the risk of death if caught. What price will she have to pay for touching the sacred bundle when as the Cursed One she is not even supposed to be in its presence? 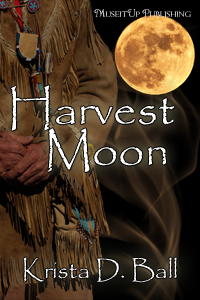 Harvest Moon is an easy to read short story full of Native American Indian culture, with a little romance and sacred magic thrown in to teach the protagonist a lesson she will never forget. Light. Magical. And a fast read. Visit Tracy’s Author Profile here! Thank you Kiki Howell for being our guest last month! Next Entry MONDAY MOVIE: Book Trailer Swap! Care to Share?